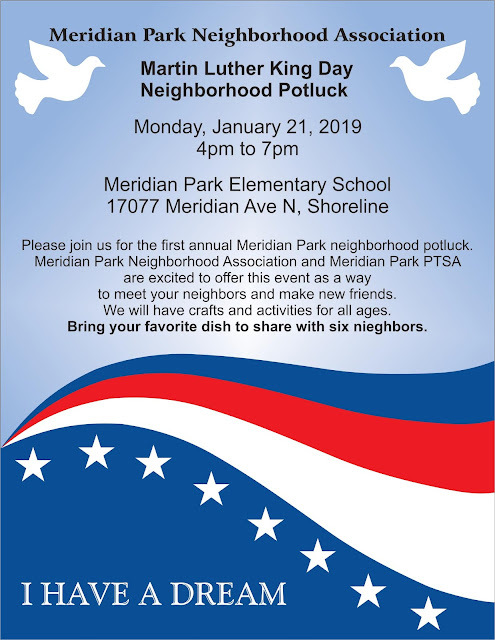 Meridian Park Neighborhood Association and Meridian Park PTSA are co-sponsoring the first annual community potluck for the neighborhood on MLK Day, January 21st, 4-7pm. Besides the opportunity to share dinner, neighbors of all ages will have the opportunity to take part in themed activities/crafts honoring Martin Luther King's work, and a neighborhood-themed scavenger hunt. Attendees are encouraged to bring a dish to share with 6 neighbors. The potluck event will be held in the Cafetorium at Meridian Park Elementary School, located at the corner of Meridian Ave. N and N 175th St. Free Parking is available in the lot in front of the school. The Cafetorium is located behind the main building by the parking lot, and is accessed by walking around the sidewalk to the left of the main entrance. The event is free and all neighbors are welcome. For more information, email meridianparkna@gmail.com or call Cynthia Knox 206-218-3302.